Prior to the official announcement that NGM Mobile Forward Racing will be competing with a modified Yamaha M1 chassis in 2014, Aleix Espargaro insists that he will first observe the decisions made by current team Power Electronics Aspar before deciding to make any team switches of his own. Espargaro has set the CRT pace at every race meeting so far this season and is generally regarding as a sought-after rider up and down the pit lane. “We have the Yamaha option at Forward,” Espargaro explained to motogp.com during an exclusive video interview at Brno on Friday. “It is not a bad option at all, but we first need to wait to know the decision of my team, which is in talks with Aprilia to know whether they want to make a (prototype) bike next year or keep this one. For the moment, we need to wait and find out - and then decide. 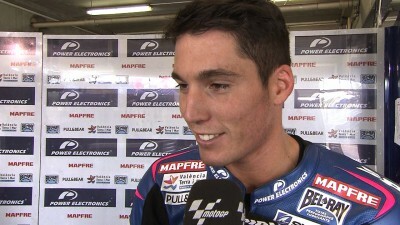 It has already been confirmed that Aleix Espargaro’s younger brother Pol, a current Moto2™ title contender, will step up to MotoGP™ in 2014 as he joins Bradley Smith at Monster Yamaha Tech3.